The Nex Flow Ring Vac Air Conveyor is available in both ANODIZED Aluminum, Heavy Duty HARD Anodized or ALL STAINLESS STEEL. Simply clamp a standard hose size to each end of the Ring-Vac™ to create this high energy conveying system. No moving parts for maintenance free operation with capacity and flow controlled with a pressure regulator. 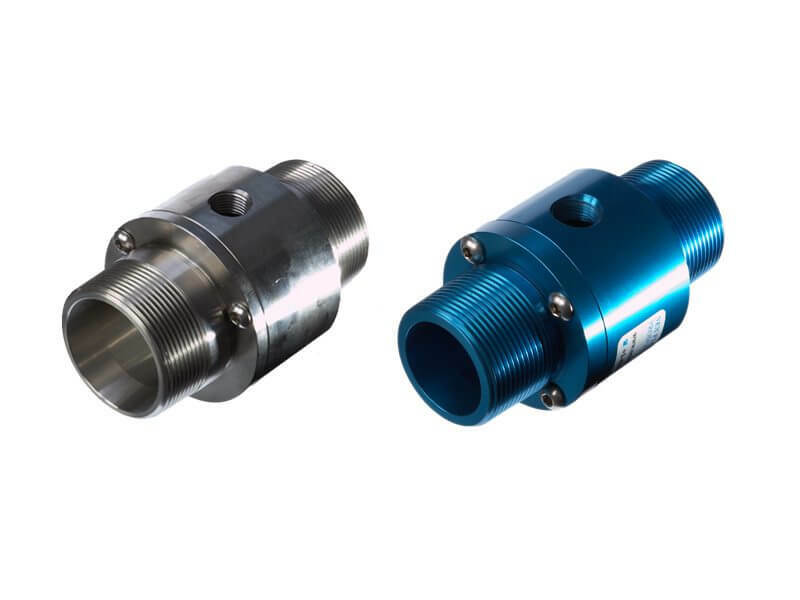 Available in standard and threaded versions for regular and high temperature applications on both 303/304 Stainless Steel or 316L Stainless Steel. Pneumatic Conveyors - Ring-Vac™ Pneumatic Conveying System has virtually no moving parts, conveys material at high rates and over long distances. It utilizes compressed air for a powerful, efficient venturi action along its length in a compact design for high capacity conveying over large distances. X-Stream™ Air Conveyors - Ring-Vac™ Heavy Duty Pneumatic Conveying System: Available in standard and threaded versions for heavy duty applications. Designed for conveying materials over a longer distance both vertically and horizontally. Made of hardened anodized aluminum it helps prevent premature wear that could occur either an ordinary anodized aluminum or Stainless Steel Ring-Vac™. The X-stream™ Supreme Pneumatic Conveying System (XSPC) has virtually no moving parts, conveys material at high rates and over long distances. Intrinsic straight through design prevents clogging. It utilizes compressed air for a powerful, efficient venturi action along its length in a compact design for high capacity conveying over large distances. Ring-Vac™ compressed air conveying system - Compressed air enters at point (A) into a annular plenum chamber and injected into the throat of the unit though directed nozzles. These jets of compressed air create a vacuum at the inlet (C) which draws in material and accelerates it through the unit and out at (D) conveying the material over a great vertical or horizontal distance. Pneumatic Conveyors ? Ring-Vac™ Pneumatic Conveying System has virtually no moving parts, conveys material at high rates and over long distances. It utilizes compressed air for a powerful, efficient venturi action along its length in a compact design for high capacity conveying over large distances. X-Stream™ Air Conveyors ? Ring-Vac™ Heavy Duty Pneumatic Conveying System: Available in standard and threaded versions for heavy duty applications. Designed for conveying materials over a longer distance both vertically and horizontally. Made of hardened anodized aluminum it helps prevent premature wear that could occur either an ordinary anodized aluminum or Stainless Steel Ring-Vac™.